Close To My Heart is partnered with Operation Smile®, an organization that provides free, life-changing surgery that repairs smiles and reshapes lives, one child at a time. From our Seasonal Expressions I catalog the stamp set "You're The Bomb" will only be available until March 31st. This stamp set has been a favorite with my daughters, both have asked me several times to make cards for their friends using this stamp set. On today's everyday cards project, I created this fun card again incorporating two types of embossing techniques, dry embossing (embossing folders) and wet embossing (ink and powder). Try them both and see which one you like best. Emboss layer B using star embossing folder and Big Shot or Cuttlebug machine. Adhere layer B on top of layer A using a tape runner or Liquid crystal. Wrap black ribbon on the left side of layer A and form a bow. Stamp "YOU'RE" sentiment on layer C using Versamark ink. Add Range super fine white embossing powder and heat set with a craft heater. Adhere on top of layer B just below the bow from the black ribbon. 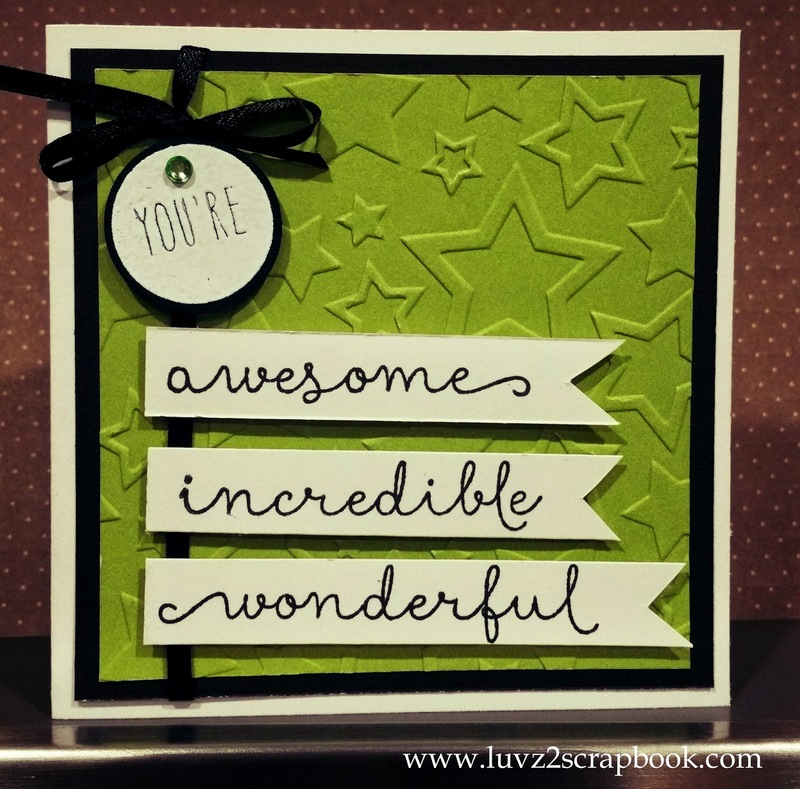 Stamp "awesome", "wonderful", and "incredible" sentiments using black ink pad on white daisy card stock, trimmed at 1/2" width and length trimmed to size. Using 3-D foam tape adhere on top of layer B. Add bitty sparkles on top of the "YOU'RE" sentiment. For the card inside, use black card stock and cut at 3.75" X 3.75" and layer white daisy card stock cut at 3.5" X 3.5".